Many of you have read all about my recent adventures with food, or, more accurately, lack of many “normal” foods. Towards the end of February, I started what ended up being 54 days of the Whole30 diet, as proscribed by the Whole9 Life founders Dallas and Melissa Hartwig. Yes, that “30” in there refers to 30 days, but I decided to go hard-core and do 60 54. You will probably also be able to tell from the plethora of posts about the Whole30 that I enjoyed it. It was difficult at times, but it forced me to learn about good food. Real food. I had to start making my own salad dressings and using better oils. I began to use all those dried spices that had been taking up space in my cupboard. I started reading labels and growing increasingly disgusted with the food and beverage industry. For 54 days (not including a “cheat weekend” after the first 30 days), I avoided all dairy, all grains and grain products (including corn and all of its derivatives), all sugars and sweeteners (including honey and maple syrup), all legumes (peanuts, soy, etc. ), and most preservatives and additives. After the first few days, I started to feel consistently great. I had a predictable and steady amount of energy from morning til night, and got great sleep. I was motivated to start running and do ab workouts. I ate a lot, learned a lot, went through vegetables and eggs like nobody’s business, spent a lot of money on groceries (and I didn’t even get the ideal grass-fed organic meats I was supposed to), and ultimately lost at least 15 pounds (I haven’t done a final weigh-in since losing more weight after the diet was completed). I was getting “wholly healthy,” as I called it. At the end of my 54 days, I needed a change of pace. Even the Hartwigs admit that the Whole30 is a bit too extreme for anyone to keep up for any extended length of time. The Whole30 is actually a stricter version of the Paleo (Paleolithic, Stone Age, Caveman, etc…) diet, and only meant to be undergone for 30 days here and there. Having done such an intense diet for two months and then needing to break free, then finding myself in exams, then packing, then moving (to a city and in with my boyfriend=major transition), then looking for a job, and on and on, I fell off the good-food wagon. I guess I’m “lucky” to be one of those people who wasn’t wracked by cramps after every bite of “normal” food after so long an abstinence, but it was altogether too easy to fall back onto more convenient foods. Convenience and frugality warred against my new good-food habits, and cooking for a non-vegetable-or-healthy-food lover further compounded my dilemma. I still haven’t fully made peace between the warring factions. Farmer’s Markets have made it easier to justify the purchase of good-quality vegetables and meats, and I am attempting to home-make bread, dressings, sauces, burgers, chicken fingers, and other favourites and staples. My plan of action is to real-food-ify my kitchen as much as possible. By “real food” I mean non-processed, non-preserved, organic ingredients wherever possible. I will use honey instead of sugar, olive oil instead of vegetable oils, organic flour and vinegar, make my own spice mixes (like seasoning salt), and generally go back to buying items without preservatives and additives. The trick will be bringing Johnathan along with me, but I accept it as a personal challenge! Two amazing bloggers help our real food revolution on an almost daily basis: Lisa Leake of 100 Days of Real Food, and Heather of A Real Food Lover. These ladies have made the spices and the sauces, the breads and the pastas, and have real food solutions for almost any “normal” junk-filled dish. 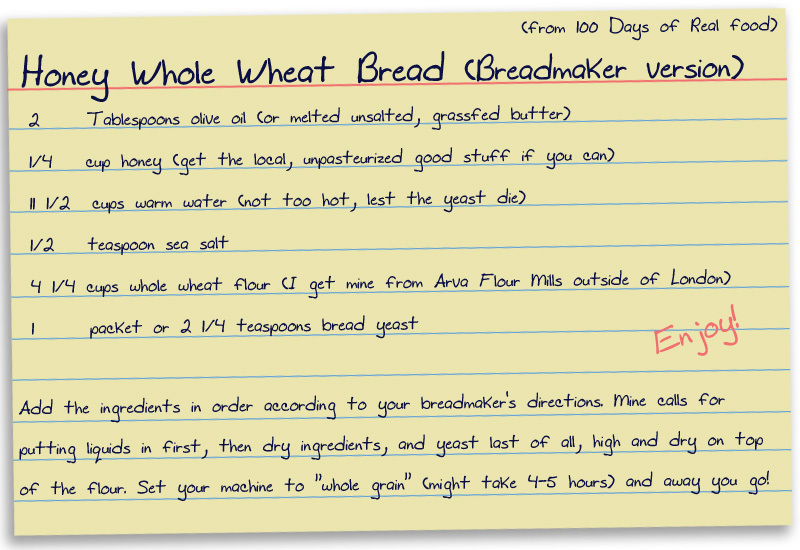 The bread recipe I have been making lately is from 100 Days of Real Food. It has turned out differently every time I’ve made it (I think I’ve been making it with 4 1/2 cups of flour instead of 4 1/4. Oops), but it’s infallibly delicious! 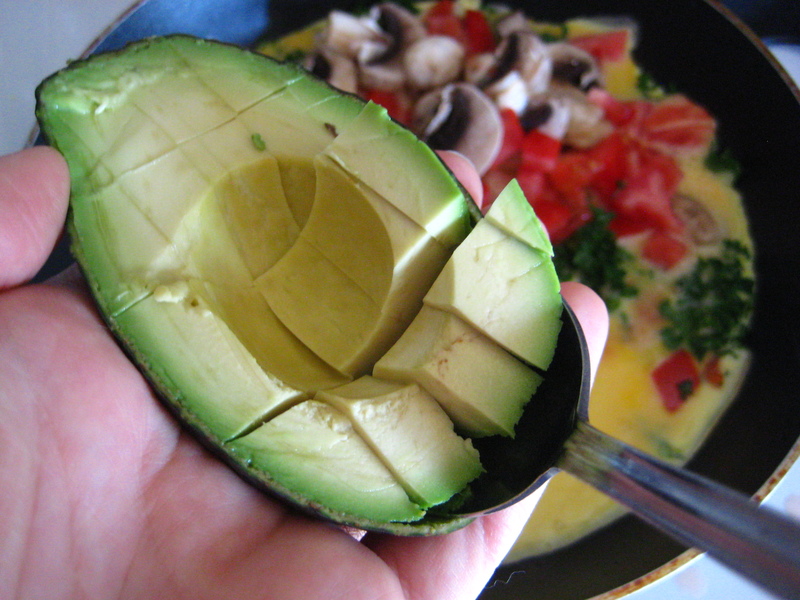 What are your go-to real food solutions? How have you managed to wean your household off of additives and preservatives? I’d love to hear your stories! I started down the road to real food about three years ago. I make probably 90 % of what we eat from scratch. It would be more, but I haven’t made crackers, or tortillas recently. I do all the breads, dressings, baked goods, granola, etc. as I am able. I weaned the family off simply by not buying anything I can’t pronounce and making homemade versions of the things they enjoyed. It becomes just a part of the daily routine around here. It’s funny, I am on my first Whole30 right now and am amazed at how much more time I have bc I am rarely baking. I made a pie yesterday and will bake bread in the morning, but I haven’t been doing all I normally do. 🙂 I figure since I am the one doing the cooking for the five of us, I get to buy what I think we should eat and serve it up. They can eat it, or wait for the next meal.